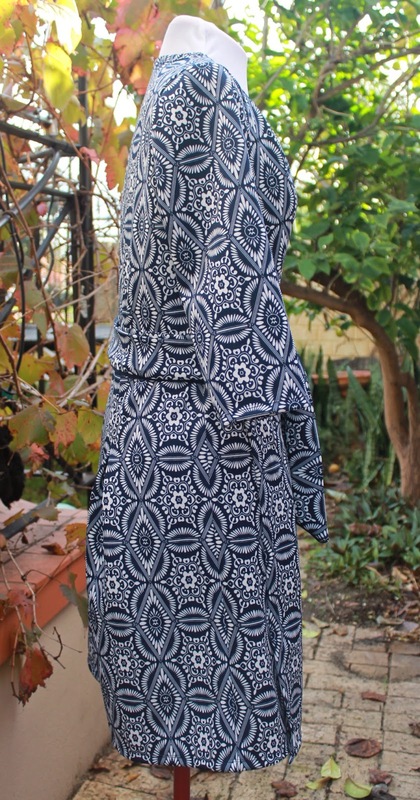 It's been a few weeks and I have sufficiently recovered from my Great British Sewing Bee challenge to attempt this wrap dress a second time. Let's just pause and admire that print matching across and down the dress. The back and the side seams. Be still my fluttering heart! How cool is that shadow? Needless to say, I'm rather more pleased with this dress the second time around. The pattern is Butterick 5454 downloaded free (sans instructions) from here. I kept my timer well and truly hidden away during this project and it was an easy and fun dress to sew, even without instructions. I don't know what it is about timing a project, but it just brings stress and all-round miserableness and I certainly won't be doing it again in a hurry! The fabric is a thickish, stable stretch knit, a bit like ponte but with a smoother finish. I got it from Spotlight. 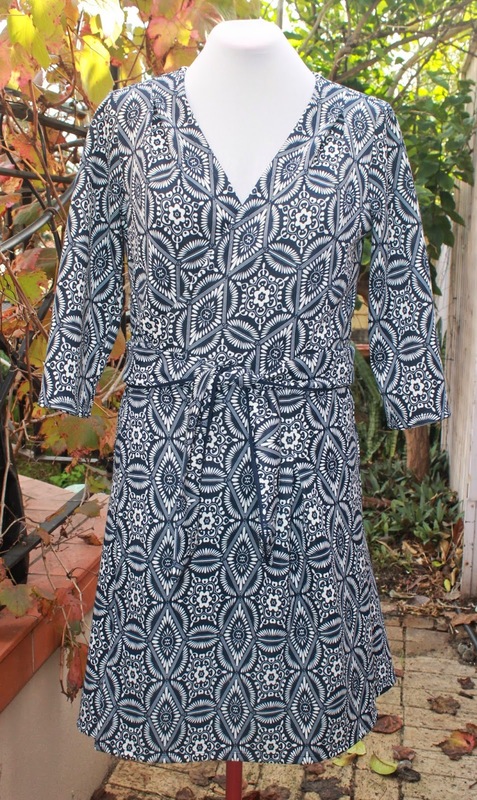 I much prefer the thicker fabric for this dress as it covers lumps and bumps from underwear and other random bulginess. The pleats at the shoulders and skirt don't sit quite as flat in this fabric, but I still think it's better than the lightweight knit. I took care with the cutting to keep the pattern where I wanted it. The front is cut on the bias and the back and skirt are on grain. I went back and forth over whether to bind the front edges or fold and stitch (which I think is what the pattern intends). In the end I folded and stitched, which means the fit is right, but there is a touch of gaping at the front, which could have been eliminated if I'd used binding. Oh well. I sewed on a little press stud and it's absolutely fine. I added some navy piping along the edge of the waist tie. It's a bit hard to see and probably didn't make much difference. It's adds a bit of interest on close inspection I guess. I like the back and the sleeve length and I'm pretty happy with the front, although the ties could have been longer. It could maybe have done with a tiny bit more length in the skirt, but otherwise I'm happy with the fit. 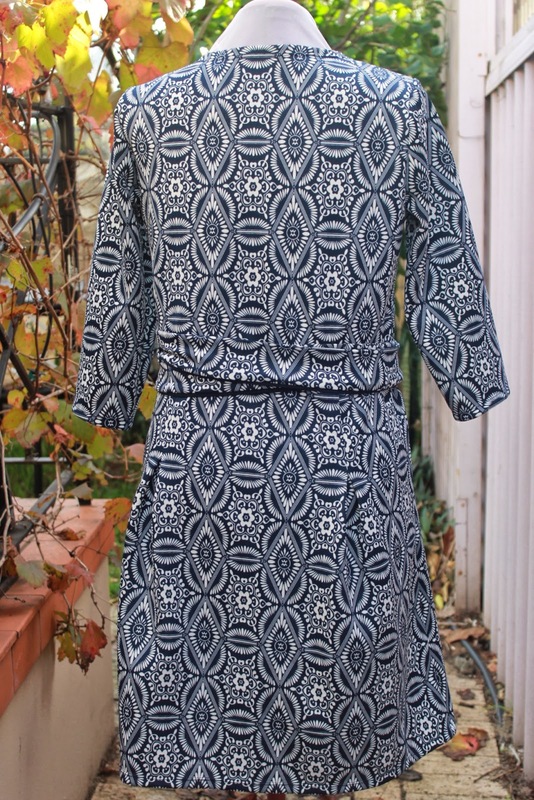 Here are some pictures on the mannequin so you can soak up that pattern matching. You know you want to! Ok, hers is a real DVF, but I bet she didn't make it herself. Just shows what good taste I have. Ha! Your pictures are so fabulous! Makes me wish I lived somewhere warmer than Canada. I love that fabric and I love your dress! Now that you've got the pattern worked out, do you think you'll make more? Oh thank you. Yes, we are very lucky with the weather here. I lived in Montreal for three years (working at McGill Uni). I loved every minute but was pleased to get back to a more civilised climate! I thought of Kate's dress as soon as I saw yours! I like yours better! You have done a fabulous job on the pattern matching Meg. Very nice stylish dress. Yes, just a bit better than the last debacle - thank you! And you have excellent taste!! This dress is very DVF worthy. I so love your work Meg. Love it...& your shadows are amazing!!! They were actually completely unintentional, but thank you! Love your dress, especially the fabric.